By Joseph L. Petri Jr. his son. My father served in Co. C, 121st Infantry, 8th Infantry Division from 1943 until discharged in 1945. He landed in July 1944, age 20, with the others and was in the thick of things across France and into Luxembourg and Germany. 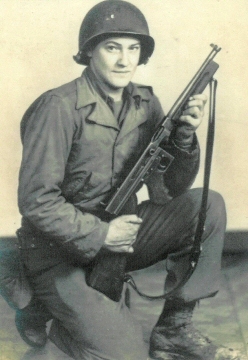 He was a messenger/scout for Lt. Fitzpatrick and Lt. Oliver and had the pack shot off his back with an MG-42, 88's fired point blank at him like rifles, shrapnel in his leg, and frozen feet. The only thing he would say about Hurtgen Forest was that it was pure hell. He carried a Thompson and wore jump boots that he traded for. 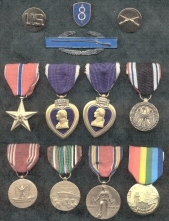 The above picture was taken in France showing him kneeling with the Thompson, and it is framed in my office with his medals. On December 22, 1944, he fought his way into a town called Obermaubach on the Roer River with the other 70 men and 6 officers. They needed to send a message back that they had taken the town and he was one of the messengers. When he got to battalion Headquarters, he delivered the message, and the major told him to get some hot food, and he could go back or stay with the HQ and ride in the next day. He went back on foot after he ate, and when he got there, found that the Germans had retaken the town. He got pinned in a cellar by enemy fire and was told to surrender. When he didn't, they tossed in a grenade and then took him out wounded. 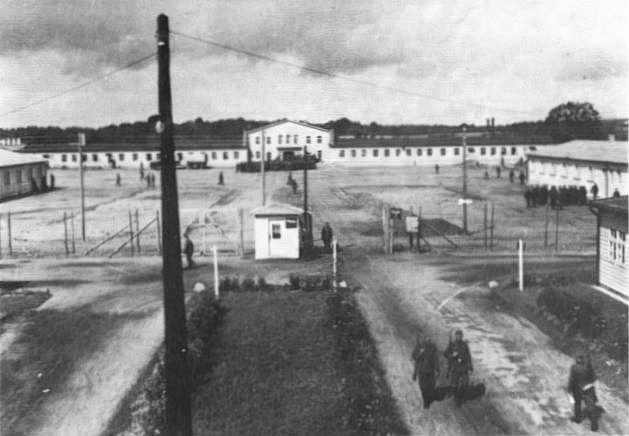 They did give him medical treatment, and then he got sent to Stalag XI-B in Fallingbostel, Germany. He said that there were something like 50% killed from his company in that battle. When the British armor rolled through Stalag XI-B in late April 1945, he was down to 90 lbs. from his normal 165. They put him in a British uniform and sent him to England to recuperate. He died in 1978 at the age of 54, and I regret never having a heart-to-heart talk about the war and what he experienced. He knew he was awarded 2 purple hearts, but didn't know of 2 Bronze Stars, which I was able to obtain through his records. He was such a humble man, and never talked about his suffering. I just want someone else out there to know how damned proud I am of him and what he did. If there is anyone out there who served with him I would love to find them.